I don't know about you, but I'm having a difficult time getting my creative juices flowing again since the holidays. 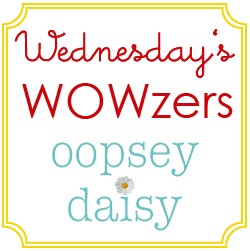 I have been organizing every square inch of my house--except for my craft room! I need to get my craft on again! This year, my mantra is "SIMPLIFY!" My brain seems to handle simple things well. But I also need something fun to look forward to! So welcome to my Valentine's Day series, "Easy Peasy Valentines." Each and every Friday, I will be sharing a quick-and-easy homemade valentine idea. All ideas will be cheap. And all ideas will be easy. 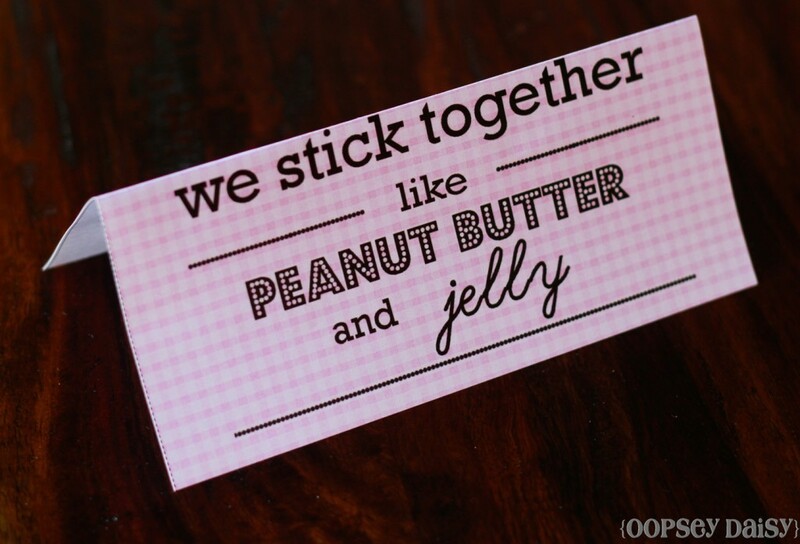 Today's valentine is print-and-go! Little Man will be handing these out to his friends in his Boys Club. 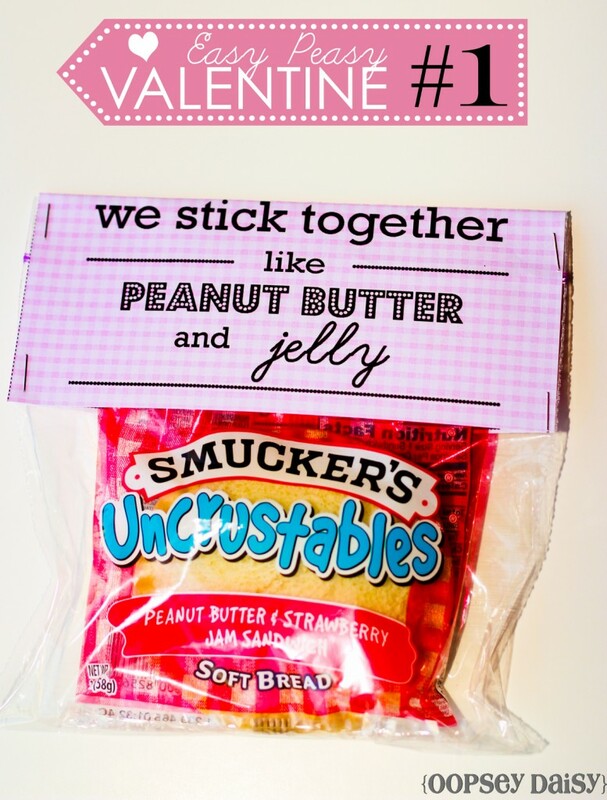 Today's valentine costs less than a $1, and what child doesn't love peanut butter and jelly?! We eat it for dinner almost every night when Mr. oopsey daisy is out of town. It's a classic. What?! 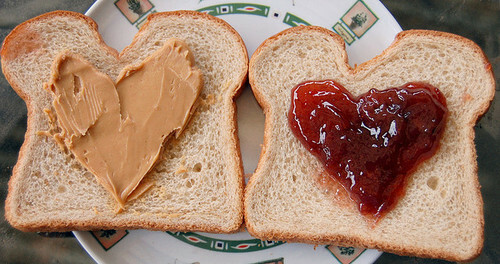 You don't think of peanut butter and jelly as romantic?! 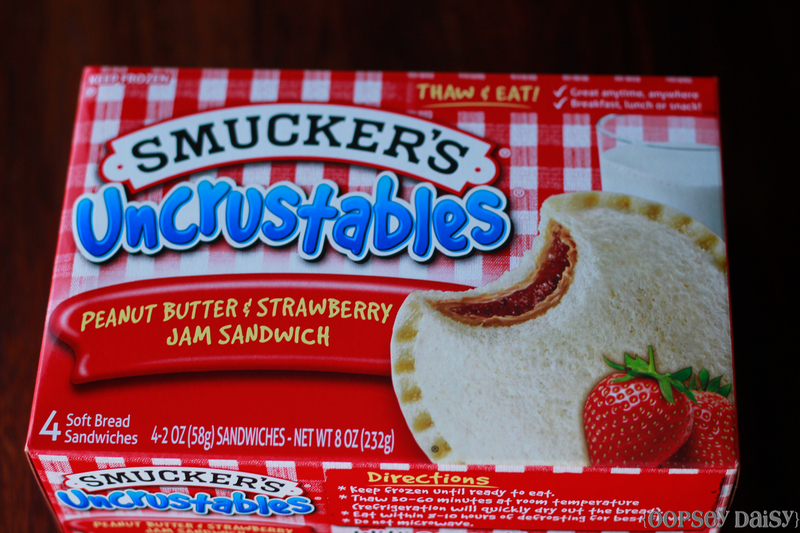 I purchased this box of frozen peanut butter and jelly uncrustable sandwiches at Wal-Mart. It was a box of 4 for $2.93. So each sandwich was less than a $1. Not bad! I created this image in Photoshop. You can download this here if you wish to create your own. 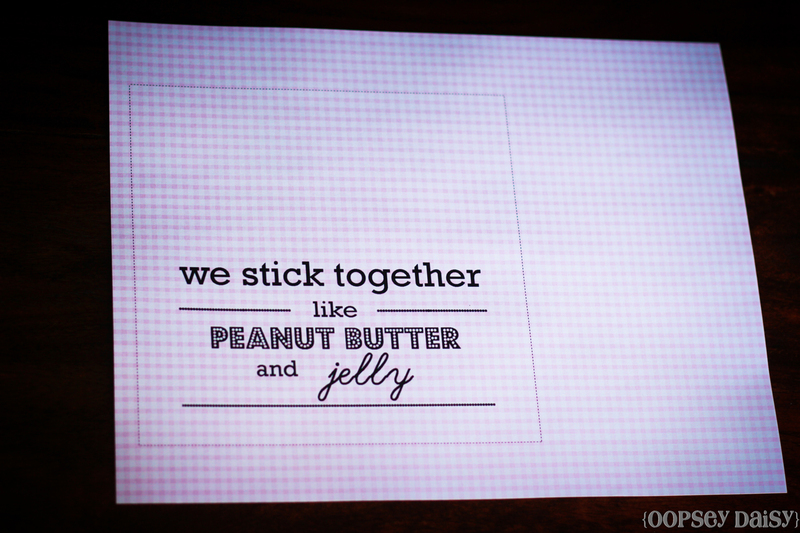 I placed this image in a Word document and printed it out on scrapbook paper. I cut out my topper and folded it in half creating a tent. I stapled this tent on top of a ziplock baggie with the sandwich inside. Simple, sweet, and kids will love it! 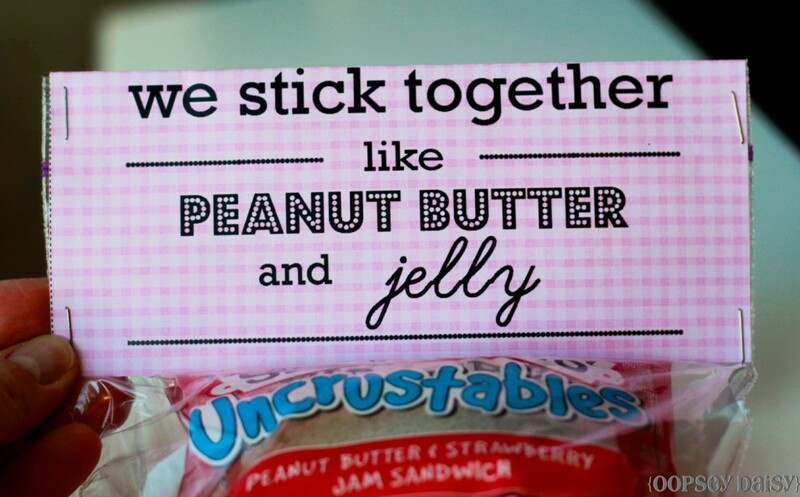 Are you working on any Valentine's Day projects yet? 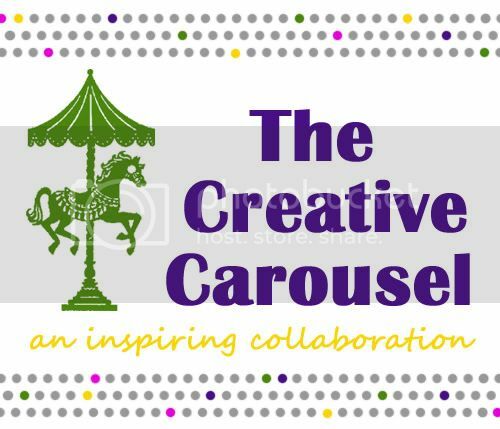 Linking up to Today's Creative Blog. Adorable, Alison! I’m on the lookout for this year’s fun Valentine for my toddler to take to daycare. 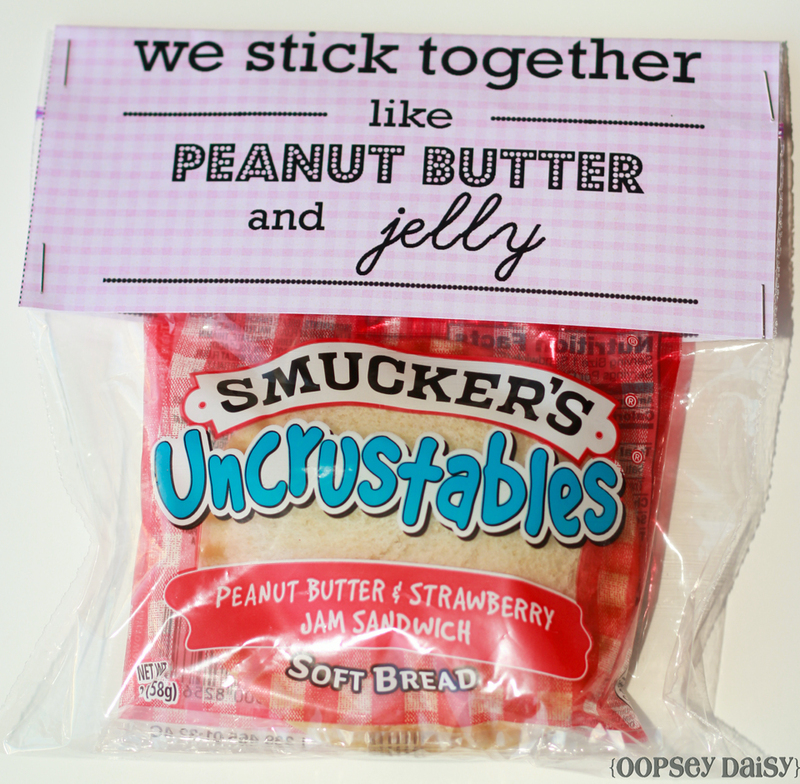 I’m not sure we can do peanut butter (allergies in class) but I love this idea!!! 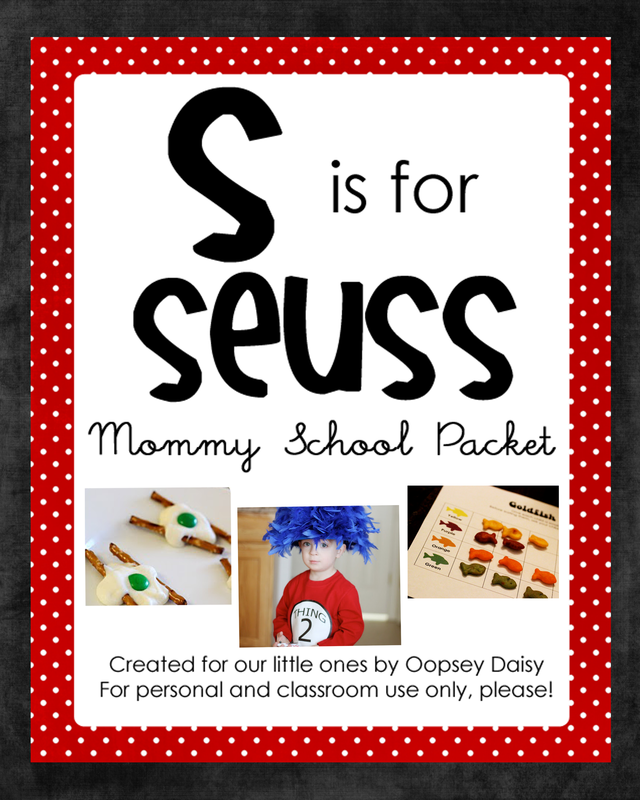 Maybe I will make one for my little man as his Valentine gift. 😉 Pinning! Yet another fantastic idea from my fantastic friend! Love this! So cute and simple!! Love it!! THANK YOU!!! I too have been in a creative rut since christmas. and this year i need to do a little something for my sons preschool class. this is perfect. and easy. Yes! I’m going to get started soon! I got the idea from Pinterst maybe even one you pinned I’m not sure but it is a bog of m’n’ms with a showel in it that says “I dig you” loove it! and I love yours!! So practical, and so easy! Great idea! 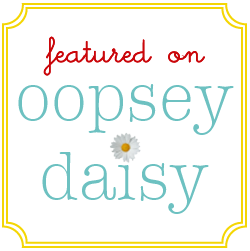 You are brave – these days my kiddos school has a ban on peanuts! One of my daughters has severe allergies so I appreciate it. Not trying to be anything negative – this is totally cute! !